I've had another ideal day in the water with my family. Have I mentioned that we are surrounded by gorgeous lakes, creeks and waterfalls? We moved out here nine years ago, seduced by the abundant swimming opportunities. Well, there were lots of other reasons, too... but it factored high on the list. 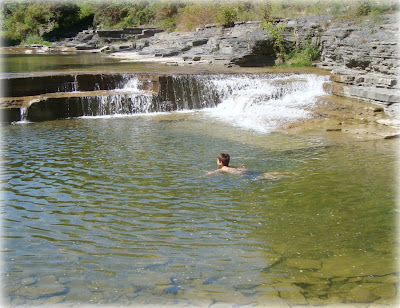 Our favorite swimming hole is part of a creek (pronounced crick in these parts) that runs into Taughannock Falls. We swam with friendly crayfish, sat in cascading water, and ate wild apples from a tree overhead. It was easy to love our day. While we were there I began to think about how simple it is to be happy when you're in paradise. But not every day looks like this, really. Each day has many challenges and some more than others. Yet, my goal has always been to LOVE EACH DAY. So how do I practice that in the midst of an average day. Right out there at the creek I started to make a list of things that I try to do each day to feel content and whole. If only as a reminder to myself, but then I thought about sharing it with you... maybe you might want to add to the list in the comment section of what makes you happy. Celebrate whatever season I'm in with passion. 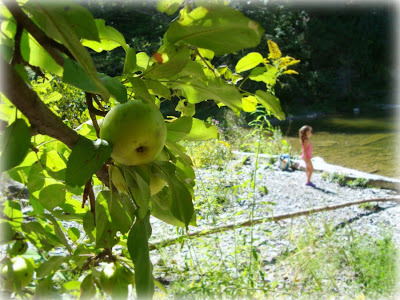 Whether it's gathering apples by the bushel or curling up by the wood stove with a bowl of soup. I try not to wish for anything else (like say, the tropics). Eat delicious, fresh, homemade meals each day. I can't tell you what an impact good food makes on my day... even more so if it's made by me or someone I love. Float in water... I'm a huge believer in nightly baths. They melt away stress and transport me. Make something... you saw that one coming! Give, in someway, to someone in need. This can be as simple as listening to a friend or as big as contributing to a charitable cause. Either way, it helps me to step out of myself and see someone else's world. Stay present in the moment... allowing my children to pull me back if I drift. They always remind me what is truly important. Being grateful for all that I have. A lot of these things are universal, others are personal. You may hate baths. You might not have children... but we all recognize the need to appreciate our lives. The act of thinking about it might be enough, but I always find it powerful to write it down. I hope you'll join me... here or on your own. 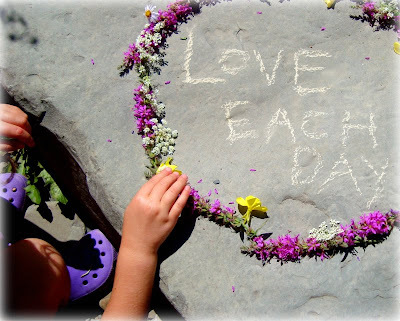 What do you do to love each day? Oh, what a great post. This has given me something to think about this evening. For me, the biggest thing I have to do to "love each day" is to constantly be asking myself if my actions are aligned with my priorities. It's easy to make excuses. I may convince myself that reading the news is what I should be doing, because I want to be an informed person, knowledgeable about what is happening in the world. But if that means I'm reading the news instead of doing the puzzle that my daughter is asking for help with, then, sadly, my daughter sees where my true priority lies (even if I myself am blinded to it). So that's what I do...all throughout the day, ask myself if my stated priorities (what I deep down want my priorities to be) match my actual priorities (what I really do with my time). The most satisfying days/years/stages of life are those in which I live according to what I really want my priorities to be. Each morning when I wake up, I use a saying from my father; "Today is the best day ever!". When he was diagnosed with cancer 5 years ago, this became his mantra, whenever anyone asked him how he was doing, this is how he replied. It not only reminds me of him, which makes me smile, but saying it reminds me that no matter what may come of that day, we are here. We have love. We have possibilities. We have another chance to see the sun rise and try our best for one another. Hope you have 'the best day ever'! Thank you for these lovely thoughts. They are like a present for me in this sunday. Whata great reminder and a fabulous list! I must confess when I first read through the list, while I agreed with each point, I found myself coming up with reasons why I couldn't manage to do them... then I stopped myself... there are just as many reasons why I can do those things and more! What a beautiful day, and the sentiments you expressed are right on. I would add laughter as a necessary ingredient of every day. I have found myself clenching my jaw at night, and these days it takes an effort to smile (my face muscles are super tight). But when my husband does a series of characters in different accents, or my son comes up with a new palindrome, or my daughter shares her funny wisdom, or my youngest comes up with one of his new dances, my tension just dissolves as the laughter comes on. thank you for sharing your list. i also strive to love each day. 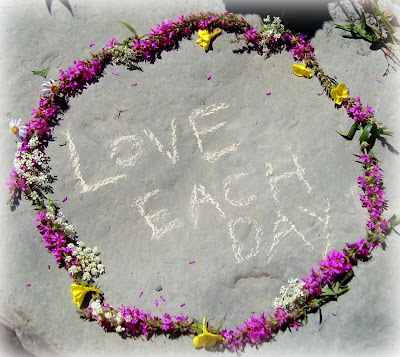 sometimes i go about w/o the intention "love each day" echoing in my mind/heart, but i find if i repeat it to myself, write it in a note to myself (to stick on the dash), or recognize the message in others' actions (or blogs!) i feel more accomplished in the practice. and feeling more accomplished in any small way on some of our days is a beautiful thing! I love all on you list. In addition, spending time with my family makes me happy. My children are grown so this usually means gathering for a meal. Almost always we end up reminiscing. Looking back into the past, remembering good times and telling funny stories we remember. The other thing that makes me happy is knowing God is in control and I don't have to analyze, plan or understand everything that happens. Thank you all for joining in! Your contributions are such great reminders.We are so much better together. I love your list. Oh how I wish we had a bath... But to this I would add: Find beauty in the world around you: there is nothing that makes me feel so connected to the universe than to just stop for a minute and admire the beauty in the natural world around us-be it a flower, a cloud, animals or whatever, Laugh! This one is easy for me as my kids constantly crack me up. Sing! Just a few lines sung along to my favourite song makes me feel so good inside. Hug! I have to have a bit of physical loving every day...even if it's just with the dog or cats. Thanks for making us think about this! Happy weekend. I love you list! I've been struggling with the need to go back to teaching full time vs. staying home with my three year olds longer. The guilt eats me up and the choice has been taken out of my hands so I'm home. I have been trying to find the love each day, I'm writing down your list in my journal and reciting it everyday! Thank you for sharing your love! I think you and I have exactly the same list. To explore nature everyday even if it only in my own front or back yard. Never ever take the natural world for granted. Rejoice it everyday like you are discovering it for the very first time. give a smile to anyone that you pass on the street, work, school, bus, shops etc... and you'll always reflected in people's faces! thanks for sharing, that was a beautiful post! Thank you so much you helped me today!! I have a really close friend that moved and I needed some good thoughts!! Thanks you are awesome!! be grateful, slow down, take a breath, look around! Every day is a gift- and so is the wisdom contained in this beautiful post with such insightful comments. I agree about making time for many of the "little" things that come up throughout the day. Imagine being at the end of your life and looking back...what moments would you remember as being the most important? Truly a beautiful post Maya! I sat here reading nodding my head as if I wrote it myself, I could not agree with your sentiments more. I appreciate your families 'motto' Love each day, ours is Be here now the thrust behind each brings us both into the same line of thinking and I love reading something so positive and life changing such as this. Your right it is easier in the days of dipping in the rivers, lakes and 'cricks' to carry these thoughts close to our hearts, I love that you have focused your thoughts on capturing this in everyday. It is when we carry the same mindset of a day of bliss into our everyday that in turn we will find bliss in each moment. oops I think I just wrote a book there ; ) This line of thinking resonates with me. if you don't mind I would like to tell you that I am Thankful, everyday I am thankful, thankful for all I have the good and the bad...the bad I take as a lesson, I have had a chance to learn and grow, to become stronger. The good for just what it is... I am thankful for the big and the small... last night I was setting at then end of the bed as the kids played on my bed..it was late, past their bed time, and I was mending a pair of pants... I looked up after I ended the stitch and they were all laying on top of each other...all 6 of them even the 13 year old looked so sweet, I remember him at such a tender age as if it were yesterday. fell asleep with a smile on my face. I guess I could have woke them and sent them to their beds... but then I would have been loney dont you think? Children give a house life...a room happiness. Have you been in a home that use to have children but dosen't anymore? LOVE this post! I too take a nightly bath to clear my head. And I love to pet my dogs every day. Thanks for making me think about the little things! Hi Maya - what a lovely list! The main things I try to do each day are pay attention and laugh. Fortunately my life is pretty blessed, and when I really do pay attention it's easy to be thankful and try to extend those blessings to others. Thanks for always being so open and willing to share! What a beautiful post! It is so important to focus on all of the goodness in life. I didn't remember knowing that you live actually near me- I live near Syracuse. I couldn't love the falls, trails, farmer's markets,etc near you any more than I do- so beautiful. Hi fellow upstate friend! Oh, I could go on and on and on! But that would feel like a huge work to do each day. Even though it's nothing like that. 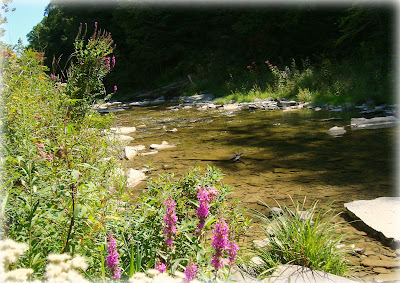 These are just 3 ways that I "love each day"
I almost forgot - we're in "crick" country too! (Wisconsin) I thought it was just a Midwest regional thing - awesome! *Speak words that are Life-Giving. *Look up and watch the birds. *Tell your family and friends how much they mean to you. *Give everyone a second chance or third or even fourth. *Make your home a place of peace. *Take time to express gratitude. *Allow mistakes and extend grace. *Honor others' opinions and choices. I'm working on these......I made this list on my blog. THank you for the inspiration. PS-My oldest daughter's name is Maya.